Robert L. Smith was born and raised in Buffalo, New York. His late father, R. Tex Smith, an amateur photographer, instilled an interest in this art form in his son at an early age. While a teenager he began his first commercial venture operating a film developing business in the Masten Avenue area of Buffalo. Bob attended Seneca Vocational High School majoring in the photography program. In later years he also attended the University of Buffalo. In 1950 he entered the U.S. Navy and served two years as a photographer in North Africa. Following his discharge he was employed at Bell Aircraft in the photography department. 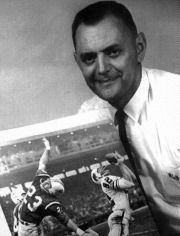 In 1956 Bob joined the photography staff of The Buffalo News, a career that spanned 39½ years. He retired in 1995. He is the recipient of many Associated Press, United Press International and Page One awards, and will long be remembered for his contributions to the field of photojournalism. He has been the Chief Photographer of the Buffalo Bills Football Team since 1960 and has just completed a book titled A View Through the Lens of Robert L. Smith: Photos 1960-1995. This is a collection of his favorite photos taken from the Bills' inception in 1960 through 1995. A percentage of all proceeds from the book will be donated to The Cystic Fibrosis Foundation and The Buffalo Bills Youth Foundation. Bob is the author and publisher of this book.